Beautiful Home! Perfect For Superbowl Festivities! 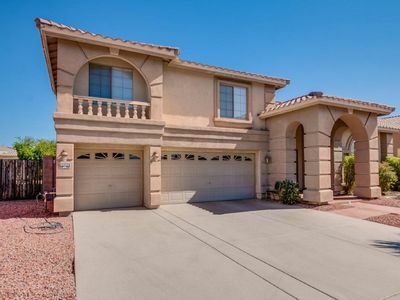 Glendale house description 2528+ sq ft, 5 bed/ 2.5 bth within 8.5 miles and only 15 minute driving distance to Cardinals Stadium and Superbowl festivities! This wonderful home is a sports enthusiast dream! 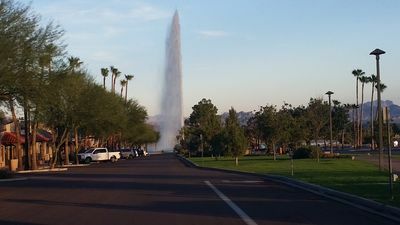 The home is less than 8.5 miles from University of Phoenix stadium host of the SuperBowl, Gila River Arena, Westgate bars and restaurants and the brand new Tanger outlet mall. 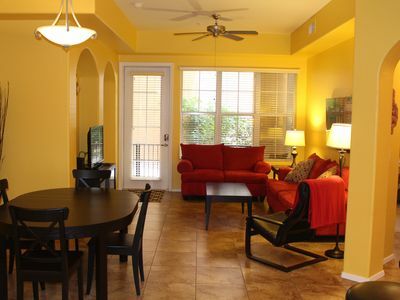 A great place to stay during the NFL Super Bowl 2015. 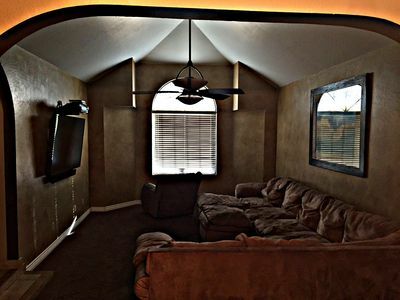 This comfortable home has 4 bedrooms and 2 bathrooms which can comfortably accommodate 8+ guests. 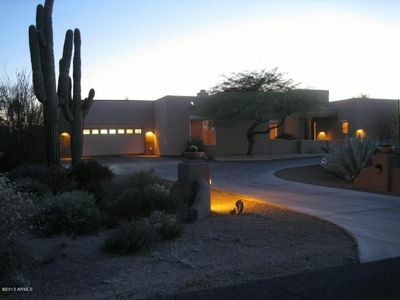 The home also has a 3 car garage, a full size washer and dryer, high speed wireless internet and satellite tv. 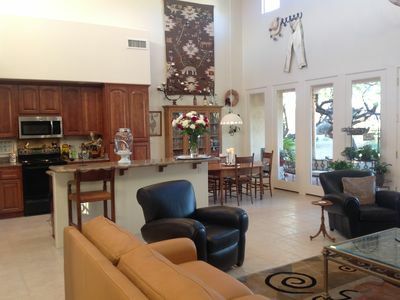 Walking through the front door you will step into the family and dining area. The cozy family room is furnished with light brown microfiber sofas with a flat screen tv mounted on the opposite wall with DVD player. The walls and are tastefully adorned with decorative pieces that create a very homie feel. 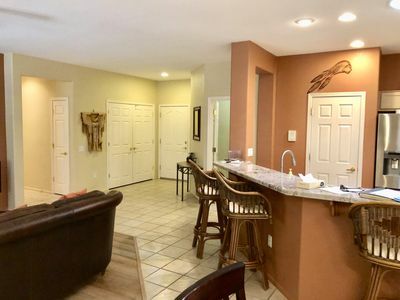 The spacious kitchen has stainless steel appliances and opens up to the family room and there is a additional high chairs in the breakfast nook/kitchen island, perfect for entertaining! Amongst many unique features you will find, stained vaulted wood ceiling, brick fireplace, two-tone paint decorator touches throughout. The cabinets and drawers are filled with all the cookware, serving pieces and utensils needed to prepare meals at home. The master bedroom is furnished with a queen size wood bed that is covered in luxurious black and gold bedding. The furniture suite includes a large mirrored dresser a nightstand and a tall drawer with a flat screen tv. The attached master bathroom has a walk-in shower and inviting separate bath tub, a double mirrored sink vanity and a private commode. 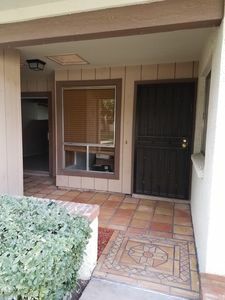 Guest bedroom 1 has a queen size wood framed bed withGlendale house description 3000+ sq ft, 5 bed/ 2.5 bth within 8 minutes Walking distance to Cardinals Stadium and Superbowl festivities! Location! Location! Location! Walking distance from the Superbowl! 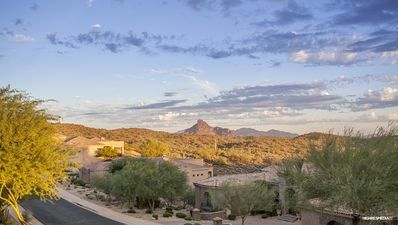 This wonderful home is a sports enthusiast dream! 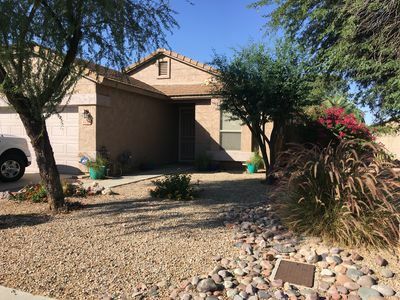 The home is less than 2 miles from University of Phoenix stadium host of the SuperBowl, Gila River Arena, Westgate bars and restaurants and the brand new Tanger outlet mall. A great place to stay during the NFL Super Bowl 2015. This comfortable Rovey farms home has 5 bedrooms and 2.5 bathrooms which can comfortably accommodate 10+ guests. 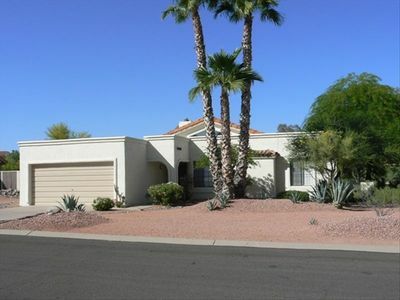 The home also has a 2 car garage, a full size washer and dryer, high speed wireless internet and satellite tv. 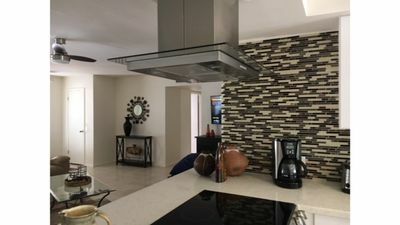 Walking through the front door you will step into the family and dining area. 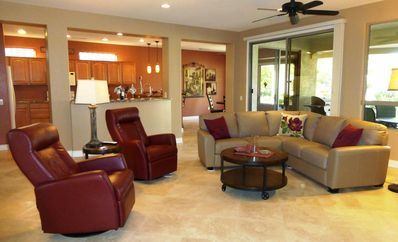 The cozy family room is furnished with a dark brown microfiber sofas. The media unit opposite the love seat has a flat screen tv, dvd player and a high speed internet modem. The walls and are tastefully adorned with decorative pieces that create a very homie feel. 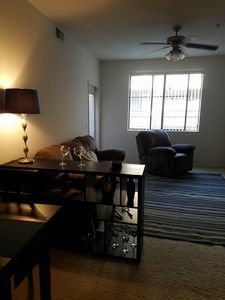 The formal dining/living area has a dark wood flooring and a leather sofa. 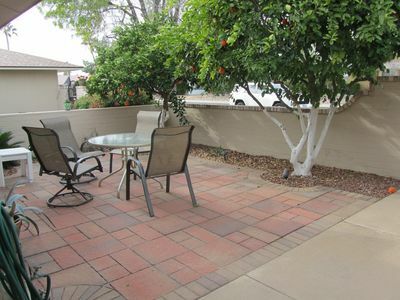 The front patio has a sitting area facing North where you can enjoy your morning coffee. 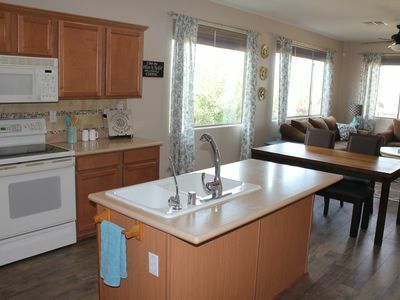 The kitchen has bright white appliances, maple wood cabinets and ivory laminate countertops. There is an additional high chairs in the breakfast nook. The cabinets and drawers are filled with all the cookware, serving pieces and utensils needed to prepare meals at home. The master bedroom is furnished with a queen size wood bed that is covered in comfortable white bedding. The furniture suite includes a large mirrored dresser and two matching wingback chairs. The opposite side of the room has a small media stand with a flat screen tv so you can watch tv in bed. 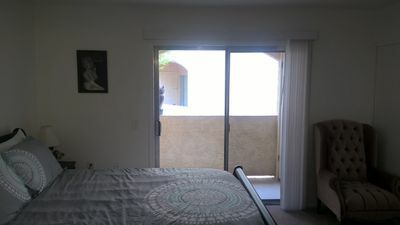 The bedroom has a giant window that looks out to the lush backyard and a large walk-in closet. The attached master bathroom has a walk shower and inviting separate bath tub, a double mirrored sink vanity and a private commode. Guest bedroom 1 has a queen size wood framed bed with a dark cherry, a matching dresser, one lighted bedside table and a tall reading lamp just in case you require more light. Guest bedroom 2 is furnished with 2 queen size beds a 5 drawer chest and night stand. Guest bedroom 3 is furnished with 1 queen size beds dresser with mirror and night stand. Guest bedroom 4 is furnished with 2 white twin beds and dresser with mirror. The hall guest bathroom has a single mirrored double sink vanity, a walk-in tub / shower combo. The backyard has grass area with an open fire pit and a large covered patio. 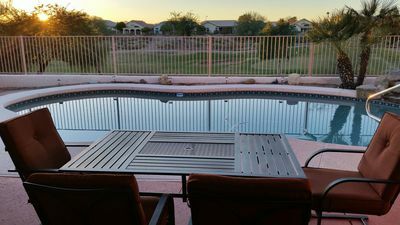 This is a comfortable 3000+ sq ft home is in a very desirable location near the major Arizona sporting events and shopping opportunities. You will not be disappointed. Book your dates now!! Guest bedroom 1 is furnished with a queen size bed a matching dresser. Guest bedroom 2 is furnished with 1 queen size beds a 5 drawer chest and night stand. Guest bedroom 3 is furnished with 1 queen size beds dresser with mirror. The property has a fenced pool in the backyard. 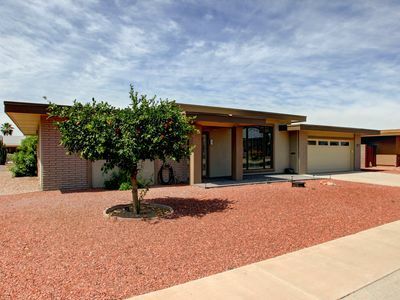 This is a comfortable 2500+ sq ft home is in a very desirable location near the major Arizona sporting events and shopping opportunities. You will not be disappointed. Book your dates now!! Sunshine, Golf, Baseball! 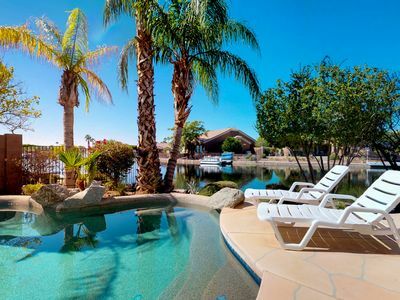 Great time to go to Arizona! Recently reduced rates for multi-month in the summer.